This is a continuation of the Creating an Effective Ad post from Dec. 2; please read that one first, if you haven’t already. Advertising is effective if you follow a few basic rules. Part 1 focused on customer needs. Part 2 will suggest a few practical steps to assure you a successful ad campaign. These steps should be used no matter if your ad is; on a card, a letter, a coupon, or some other format. You want your customers’ loyalty; your customers want a fair deal. Your credibility is based upon how you relate with customers, this needs to come through in all your advertisements. Your attitude and sense of a fair deal must be evident in all your ads to build successful customer relationships. To get a potential customer’s attention, you need to give them a reason to consider your product or service. The best, and easiest, way to get attention is to make a special offer. However, the offer must be clearly stated, simple to understand, and able to draw people into your business. Discounts or something free are typical examples. Keep written copy in your ad brief, to the point, timely, and engaging. Make sure you carefully proof read every ad that goes out several times with your eyes wide open and your brain completely focused on the topic matter, offer, and any possible misunderstandings in the copy. Make sure you have selected the correct market population that is close to your place or places of business if you have fixed locations; if a service business, make sure you have targeted the correct homes or apartments in your service area. If your ad has generated a potential customer, make sure you have given them the maximum attention required to make a sale, and always attempt to continue an on-going dialog, even if they did not use your service or product after their initial inquiry. They originally came to you for a reason; timing is every thing, the following months may allow for a better opportunity for you to assist them. Never quit following up on past customers or potential customers, I am amazed how many times a simple phone call a year or two after an initial contact has lead to a successful sale. Don’t try to close sales too quickly. By engaging a potential customer into a conversation, when practicable, will, in some cases, lead to larger sales or additional opportunities to provide other services or products. The key to any effective ad campaign is repetition. I cannot stress this enough. Write on your note pad, post it on your desk, paste it on your bathroom mirror, remember to say it at least every morning, noon and night . . . REPETITION, REPETITION, REPETITION. In other words, send the same message or offer or variations of an offer, and always keep your business name in front of your target population as frequently as financially possible. O.K, that’s it for me. 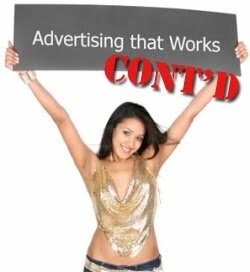 How effective your ads are depends on a number of things, but this brief list is a very good start. Now, you have my opinion. What are your thoughts on effective advertising? Many people are starting to comment on my weekly ramblings, I welcome your comments as well.